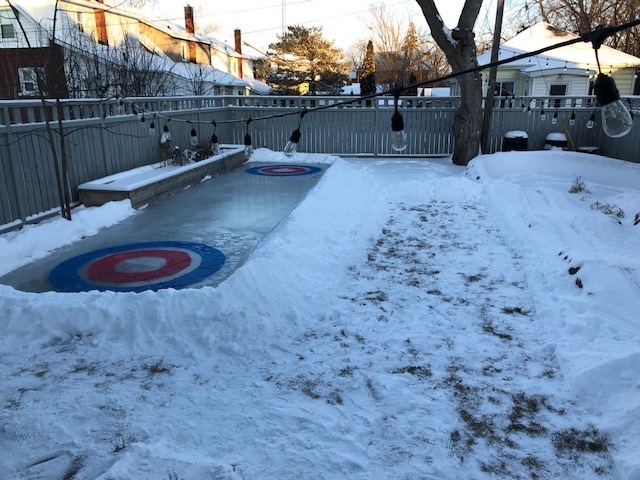 You hear a lot about backyard rinks but not backyard curling rinks. Well Aaron Kempf managed to MacGyver a mint one in his Peterborough backyard—all at a cost of only about $100. Kempf fashioned lights across his backyard in the summer so he could ride his pump track—a type of off-road terrain for cycle sport—after his daughter went to bed, and the rink was a way to continue to take advantage of the lights throughout the winter and also a good excuse to get out of the house on winter nights. At first, Kempf tried just shoveling snow in order to make a rink outline but the first few snow falls they got in November and December all melted. “In early January, I bought a couple 1x4s and made a rough frame for the rink. I then spent a weekend spraying several thin coats of water,” he tells PTBOCanada. Kempf says the 1x4s did not create a water tight seal so he chipped a bunch of ice from a couple puddles that had formed in the corners of the pump track and used that to fill the gaps. After that, he continued slowly flooding it. The outer blue rings are two round plastic tablecloths he got from Dollarama. Kempf measured so each ring was a foot wide and cut the excess off. The red rings are from a single rectangle plastic tablecloth—also from Dollarama. He cut it in half and freehanded two circles with a sharpie and a pair of scissors. After that, he set them on the ice and flooded overtop a few times. The rocks were made from two $1.25 metal bowls from Dollar Tree—”the bowls at Dollarama were twice the price and too tall,” says Kempf, who punched a hole through the top of half of them with a screwdriver and then cut out a rough circle with a jigsaw. The last step in creating the rocks required cutting a slit out of foam backer rod with an razer blade and wrapping it around each rock. The family has made good use of the rink thus far, including Aaron’s wife Alix and his folks who are in town from British Columbia for a couple weeks of visiting. Kempf himself is no Olympic curler or anything—”I have curled once in my life before this, watched it on TV a few times, and course seen the Paul Gross classic Men with Brooms—but that’s besides the point. He’s not the best skater so a traditional rink didn’t make sense, wanted to take advantage of Canadian winter, of having a backyard (“we moved from a Toronto apartment a few years ago so we are trying to make the most of it”), plus Google made it look relatively easy to build.